Jets cornerback Darrelle Revis has been charged with two counts aggravated assault, one count making terroristic threats, one count robbery, and one count conspiracy to commit aggravated assault following his alleged involvement in a street fight in Pittsburgh early Monday morning. 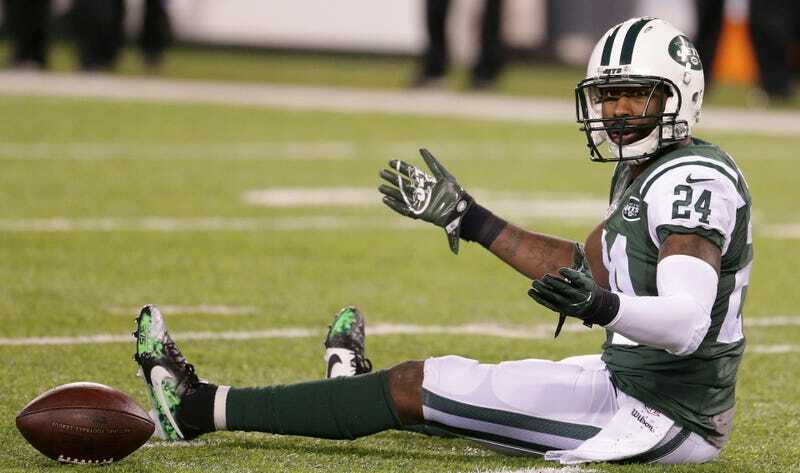 News of the alleged incident broke yesterday afternoon, but Revis wasn’t officially charged until last night. WTAE obtained images of the criminal complaint, which provides a fuller picture of what allegedly happened. According to police, three men—Dallas Cousins, Zacheriah Jarvis, and Nathan Watt—approached Revis and asked him if he was in fact Darrelle Revis, the professional football player. Revis told them who he was and then became agitated and shoved Cousins in the chest, police say. This prompted Cousins to begin video recording Revis with his phone, which police say further enraged Revis and caused him to grab the phone and toss it into the street. According to police, another man arrived to assist Revis, at which point Jarvis and Cousins were punched unconscious. Watt told police that Revis then got into his face and threatened him, saying that there were “more guys coming” and asking Watt if he wanted “to be next.” According to the report, Revis then fled the scene with the unknown male who had arrived to assist him. The report also states that the responding officer reviewed the video captured by Cousins’s phone, and determined that it shows a man fitting Revis’s description becoming hostile towards the three men. According the report, the video shows an angry Revis walking away from the group before stopping and asking, “Why are you following me?” several times.